© 2003-2006 Amberlea Equestrian Services, all rights reserved as protected by law. Please obtain permission to use the content, photos or graphics found on this site. 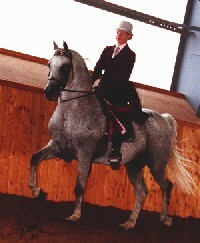 Hennessy was purchased in 1993 by Dessia primarily as a show horse with any breeding treated as a bonus. Because the focus has been on competing, very little promotion was done of this wonderful sire and he has bred a limited amount of mares. His foals are treasured by their owners and rarely come up for purchase. Hennessy's show record is extensive and has not been limited to recognized competition. He has shown successfully at local Fairs, The Royal Winter Fair and open shows as well as at Class A, Region 16 & 18. 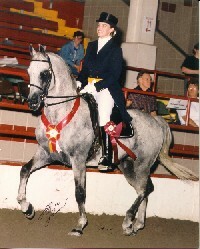 He is a Regional Champion, Reserve Champion or Top 5 (1993 - 2002) in Country English Pleasure, Show Hack, Native Costume and English Side Saddle. He is consistently in the ribbons in Open, Junior to Ride and Amateur classes. 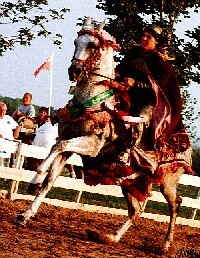 Not only has Hennessy excelled in the show ring, but also in Competitive Trail and Endurance. He has completed 237 miles in Novice and Open divisions. In the Open division his P&R scores have been excellent and if he hadn't over reached (being show shod), would have near perfect scores (0.25). 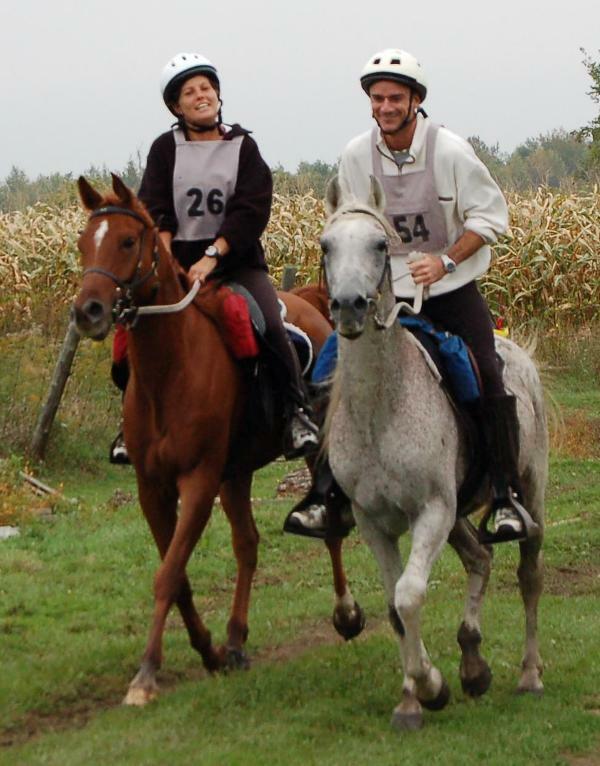 Hennessy also completed his first 50 mile Endurance Ride in October 2003 and a 60 mile in 2005 finishing a strong 6th. 2006 found him on the trails again at 22 looking great and having fun. Several of his foals have also successfully competed in CTR - Hennessy's Pride, Hennessy's Scarlet Ribbon, Parker AES, Cabasco and Amberlysa. Hennessy's foals are following in his show ring footsteps as well: Hennestar - Top 10 Canadian National Champion in Hunter Pleasure JTR; Hellana - Regional Reserve Champion Pleasure Driving; Amberlysa - Top 6 Eastern Canadian Breeder's Championship Hunter Pleasure Open & Junior Horse; Parker AES - Regional Reserve Champion Saddle Seat Equitation, ECB Reserve Champion CEP Junior Horse & 2006 Canadian Champion 50 Mile Endurance horse; Cognac Amberfyre - Junior Halter Champion; Cabasco - winning in CTR, Top 3 every time out! July 23rd, 2006 Hennessy suffered likely an aneurism and died extremely quickly while attempting to cover a mare. He is missed by his extended family and especially Abbey and Dessia. His accomplishments were many and he will be remembered through his offspring in the show ring, the breeding shed and down the trails.